This time of year we warm-up from love in our hearts. We spend time thinking of young love, romance, engagements, and weddings. It is almost Valentine's Day! This Summer I had the honor of connecting a family heirloom to four generations. This heirloom is Prince Charming's mothers wedding gown and veil worn the the day my husbands parents were married. 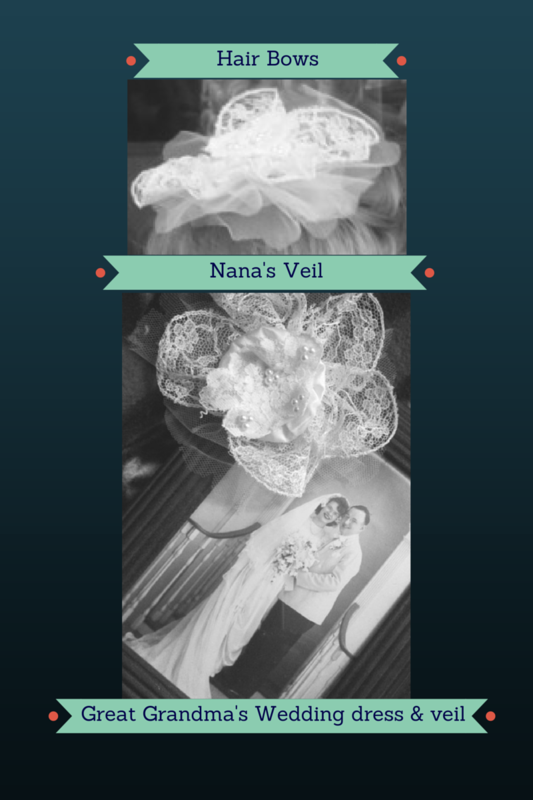 The second treasure is his sister's veil from her wedding day to her husband. My niece was getting married to her beloved Beau. I asked her if she wanted me to make her ring bearer pillow (my great nephew) out of part of her grandmother's wedding attire and her mom's veil. She said yes! I was thrilled as Auntie Karen Marie loves to make things special for the, "Kids." In the planning process I had a brainstorm my twin Great nieces would need bows for their hair as flower girls. We decided that they would each wear a custom made hair bow from the dress and veils of there Great Grandma and Nana (Grandmother). As you can imagine saving a piece of family history can be rather scary and a bit emotional. These items were not preserved and sealed but placed in a heirloom box with blue tissue paper. While washing the 67 year old materials by hand sections that lasted the test of time in the sink dissolved into my empty hands. That moment startled me but, I grabbed another piece of fabric it survived the gentle cleaning. After letting the silk and lace dry over night I started on my design. The pillow design came from Grandma's Dress. The long sleeves had beautiful gathering this became the front and the back of the pillow. I cut a long rectangle piece of fabric and shirred it to create a gusset edged pillow. I hand stitched the gusset to the front, then to the back leaving an opening to fill the pillow with fiberfill. 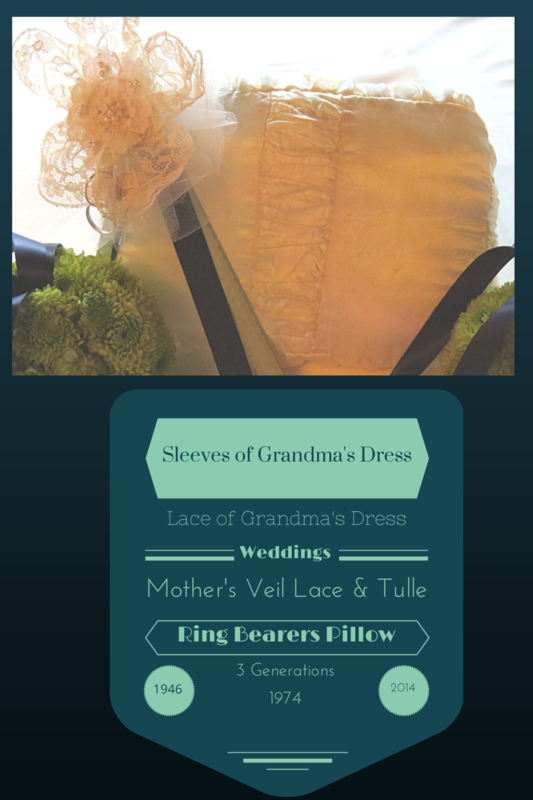 The embellishment included the brides mother's veil along with grandma's gown and veil. I removed all the lace from both veils, the gown and saved the tulle from the newer veil. 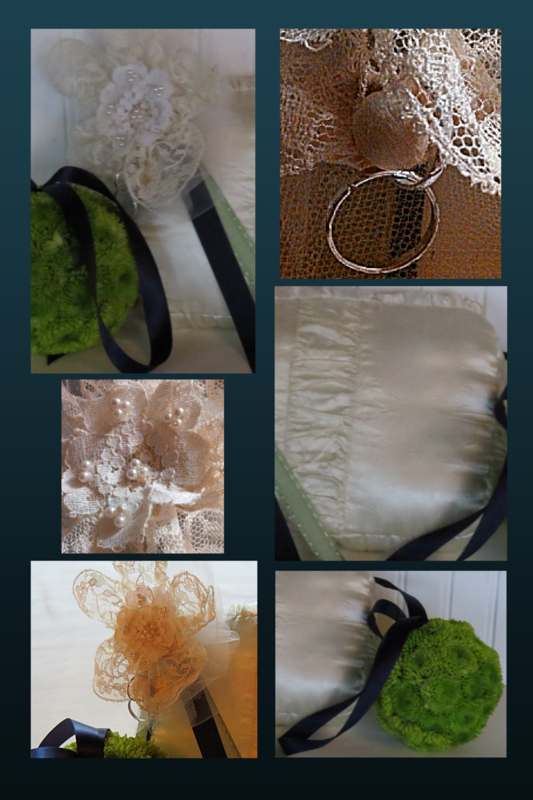 The First layer was the tulle, I folded it in half stitched down the middle and gathered to a rosette shape.The next layer on top of the tulle is the 67 year old lace gathered as well into the same shape. Then I did the same thing with the satin. The center is made of an applique lace from the newer veil. I made three of the same embellishments. Two became the bows for the flower girls hair. How I attached the rings was a favorite part of mine. I took a section of the loop & buttons from the 67 year old gown turned it right sides together with some lace hem tape hand sewed tiny stitches to give the button and loop a finished edge and tacked each part into the embellishment. The rings actually are buttoned to the pillow. I Love the Button detail! 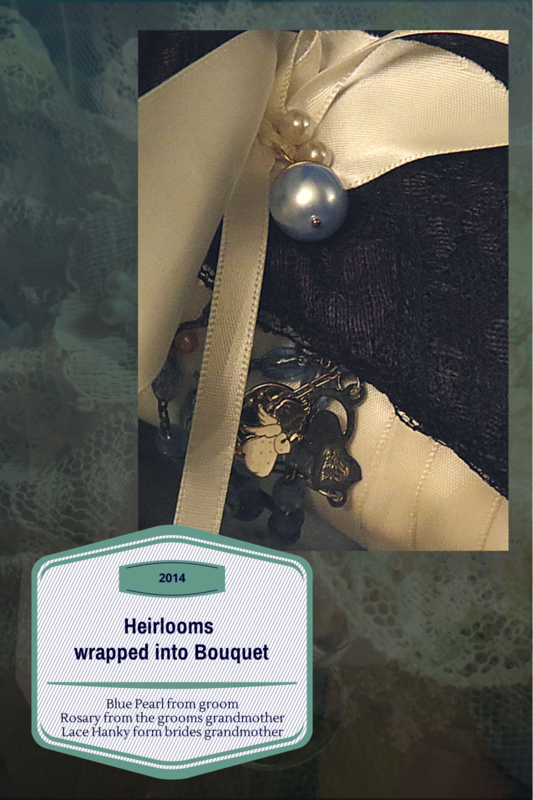 The colors of the wedding are Navy & Green, like the shower post, (Link here) to add a pop of color I tacked the navy and green ribbon to the pillow. These sweet pictures are on the big wedding day. 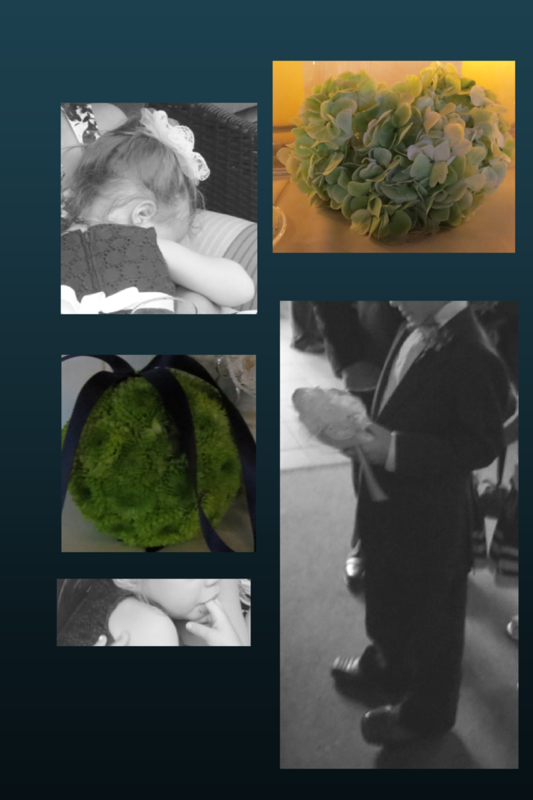 It is the second wedding in three weeks my great nieces and great nephew have been in this Summer. They did a terrific job for their Auntie and Uncle on the wedding day. The excitement was exhausting as you can see. Visit the first shower post by clicking here. The twins hair bows are saved for their wedding days.They can sew it into their gown either hidden underneath, part of the veil, or whatever they choose for their wedding day. The pillow will be passed down too. This does cause me to pause and wonder how many more generations will be blended through this love? I would love to read a story you have to share about your family connections. Please write me a note in the comments. I will personally respond. Oh what an amazing tribute and beautiful way to have something so special reused and treasured! You did a lovely job and made some ladies so very happy! Thanks so much for your sweet words. I am blessed to have had an opportunity to make these Family heirlooms and I can't imagine what the future holds for them. How many special moments will they live on in the family? Karen, this is such a wonderful gift you have made these people! Weaving those items into their wedding is a wonderful idea! How I wish I had items like that so I could do the same for my kids someday. 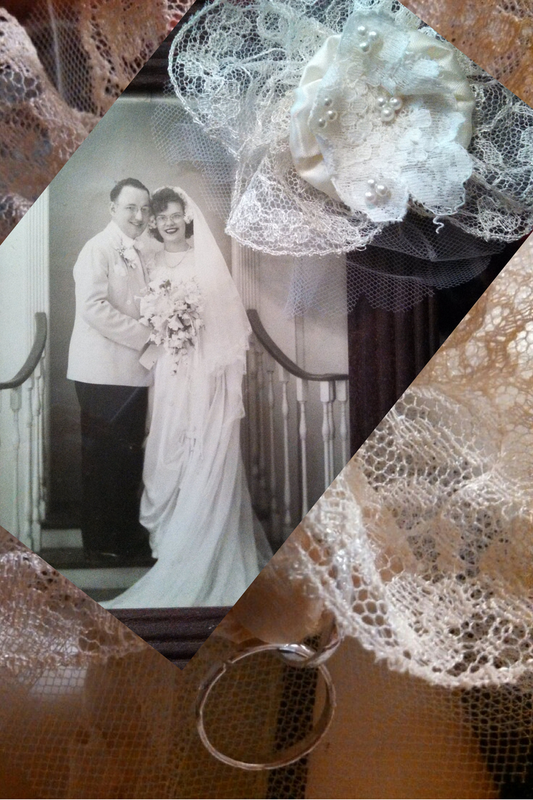 I wore my grandmother's wedding gown and used the band that belonged to her grandparents. Those touches meant so much! What a beautiful way to tie past love with future love - an endless line of love through the ages and generations. I think it's really special to use family history in our present lives and honour people who lived before us. You did wonderfully at preserving the lace and transforming it into something new. This is so lovely! I would never have thought to do this, so beautiful and a great way to incorporate family history / tradition into the wedding! How incredible! It is an amazing talent to be that creative. How wonderful you have saved all these precious items through the years to be passed one and used! They are so beautiful. What a beautiful and special gift you have made. You did a beautiful job!